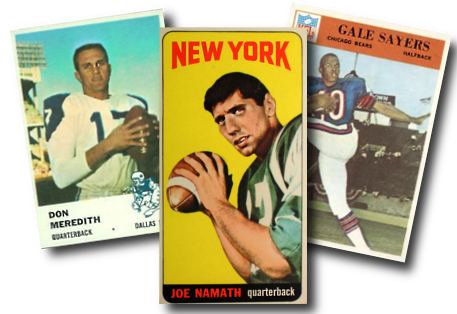 Buy 1960s Football Cards Online - Topps, Fleer, Philadelphia, and more! The launch of the American Football League in 1960, began a decade of competition for Topps in the football card market. The annual Topps football card sets had images of the players of the NFL, while Fleer began producing sets representing the AFL players. In 1964, the NFL Players Association signed a 4-year contract giving the Philadelphia Gum Co. the right to produce football cards. Topps then began producing sets representing the AFL - replacing Fleer. Although the Philadelphia football cards are interesting, the quality of the cards produced never quite caught up to Topps. After the two leagues merged, Topps was the logical choice to produce the football cards for both leagues and issued the first NFL/AFL combined set in 1968. Click here to SELL your 1960s Fleer, Philadelphia or Topps Football cards.